Nail swapping is so much fun! It's so wonderful getting to know ladies from across the globe over a shared love of nail polish. I now have SO many untried polishes now that I am determined not to purchase any new polishes until I go to HK in November! We'll see how I go sticking to it lol but I just have so many lovely overseas lacquers to try yay! 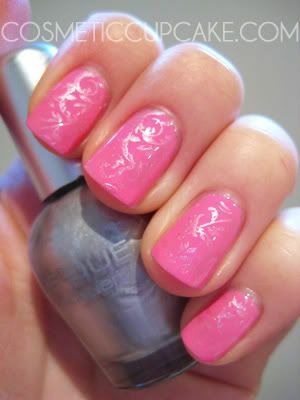 Here's my quick NOTD using the Greek polishes I received from Christina from Cel's blog. 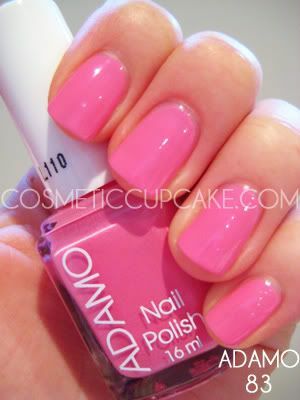 I used Adamo 83 which is a gorgeous bright pink creme. The formula is a little thick so I added 1 drop of Seche Restore which did the trick. I had to be careful to not go over my strokes as it would create tiny bald spots but nothing too difficult =) The 1st coat was streaky so I did 2 coats which is pictured below without topcoat and it dried to a high gloss finish. It's such a pretty pink! It's just bright enough without being too in your face. I also love the fact that these bottles contain a whopping 16mls of polish! Most polishes are between 10-15mls only. Just a little trivia! Hope you like it! Don't forget to enter my 200 followers giveaway here! It ends tomorrow! What a sweet, subtle mani, love it! I'm glad your swap went well. This color is gorgeous! I haven't actually used this colour yet myself. I wonder if the polish was thick because of travelling in the heat. @Alexa1202: Thanks Alexa! Your blog is cute =) I'm addicted to konad too! @Nikki: It does look kind of similar doesn't it! In person you can tell more of a difference between the 2 when stamped though. @Asami: I'm glad you like it Asami! It's a unique pink in my collection and I love it too! @Donna: I like bright colours but not all the time, it's nice to do a more subtle mani occasionally! @Anh Nguyen: I know, such a huge bottle huh! I doubt I'll be able to finish the bottle, there's just so much! @Enamel Girl: All my swaps have been amazing experiences =) Glad you like the colour! @Cel: Thank you so much for this pretty pink! I don't have pinks like this in my collection so it's a very welcome addition =D Hmmm I wonder too, it could be a factor definitely. But not to worry as there's nothing a little Seche Restore can't fix ;) Besides it's such a pretty colour! @Ivana: You are very kind Ivana! I like how the Erre Due silver comes up a little pinky-silver when stamped over the pink.